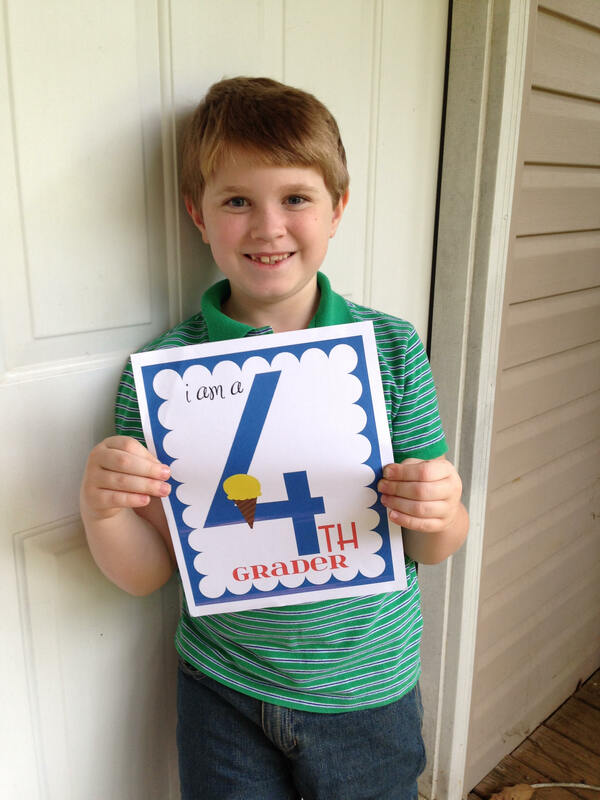 We are tackling FIFTH GRADE this year! It seems so BIG. Such a leap from last year. The work area always looks so nice on the first day. Then it never looks that good again. LOL. And of course, you can’t have a first day without the obligatory printed sign and pictures. But special snacks help! And we’re off! 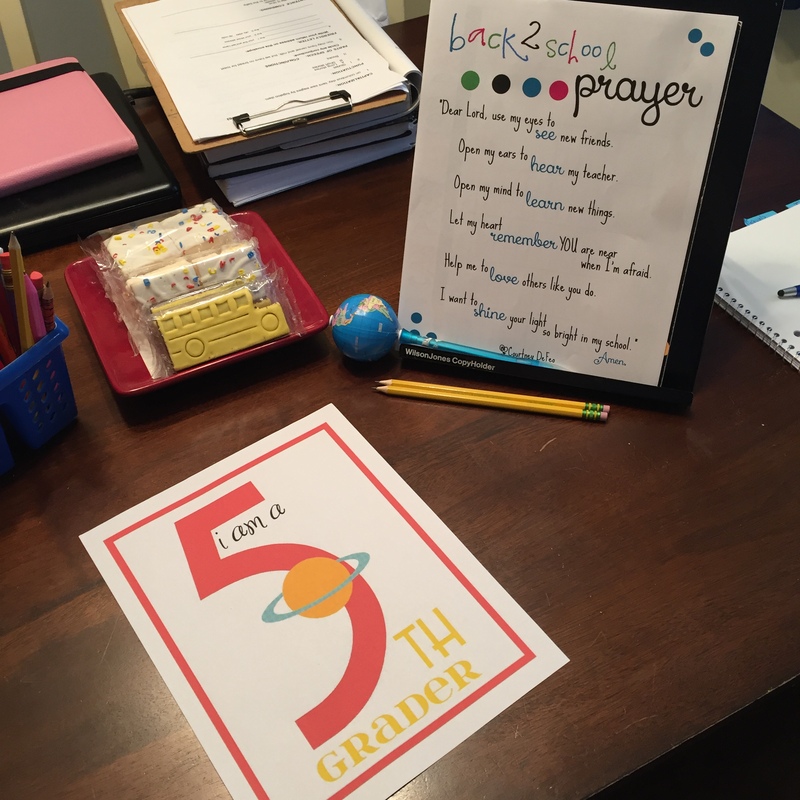 What grade(s) are you homeschooling this year? Whew! What a year! 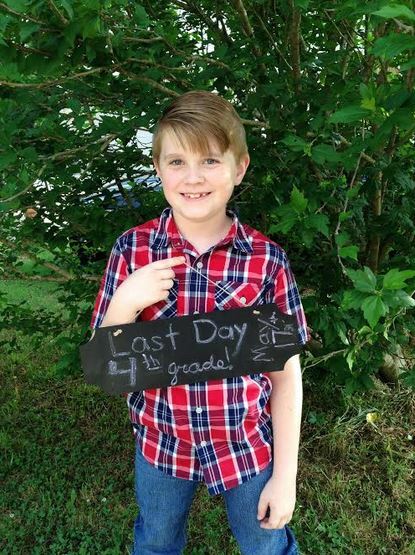 I can’t believe this handsome fella is finished with FOURTH grade! Whoa! I’m emotionally not prepared for him to be a 5th grader. That just sounds so…BIG. We enjoyed our year this year using Sonlight Core C. G wanted to take a picture with some of his favorite books so he would always remember. 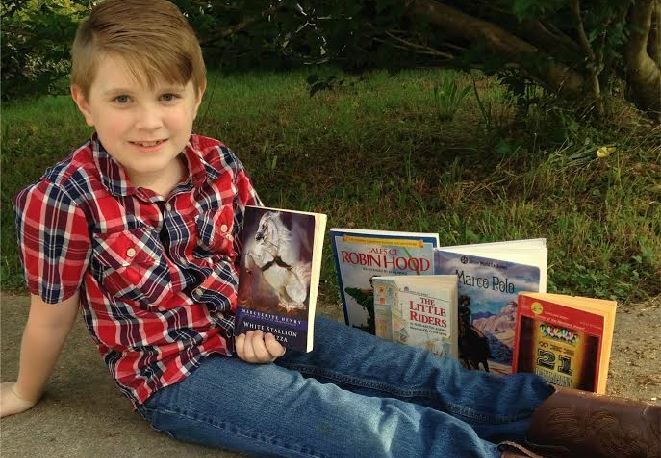 Marco Polo (Junior World Explorers) This is the only reader that made his list of favorites. It’s such an odd book to make his list of favorites but I’m glad he liked it! 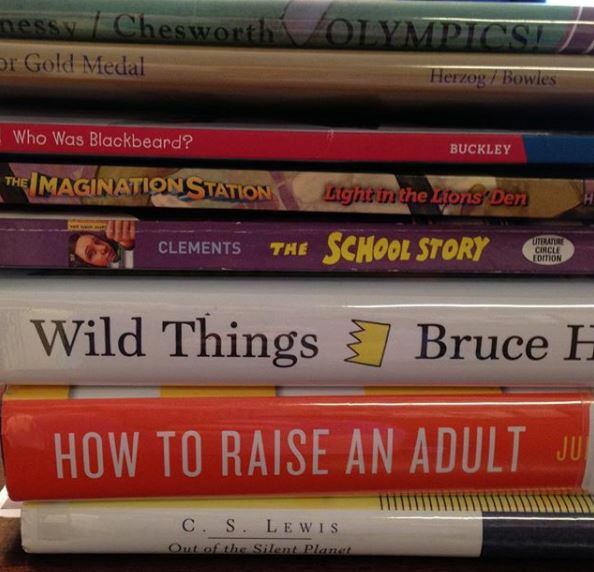 Obviously the top books are G’s. We are brushing up on the Olympics. The next two are his reading. The School Story is our read aloud. The last three are mine. Though I’m struggling with the bottom one. I’m trying but I just haven’t gotten into it. Who knew C.S. Lewis wrote space travel books? I can’t wait to start sharing with you a great book every week that we have enjoyed that I think you should read also! Here is the first week’s book! Tucker is a streetwise city mouse. He thought he’d seen it all. But he’s never met a cricket before, which really isn’t surprising, because, along with his friend Harry Cat, Tucker lives in the very heart of New York City―the Times Square subway station. Chester Cricket never intended to leave his Connecticut meadow. He’d be there still if he hadn’t followed the entrancing aroma of liverwurst right into someone’s picnic basket. Now, like any tourist in the city, he wants to look around. And he could not have found two better guides―and friends―than Tucker and Harry. The trio have many adventures―from taking in the sights and sounds of Broadway to escaping a smoky fire. Chester makes a third friend, too. It is a boy, Mario, who rescues Chester from a dusty corner of the subway station and brings him to live in the safety of his parents’ newsstand. He hopes at first to keep Chester as a pet, but Mario soon understands that the cricket is more than that. Because Chester has a hidden talent and no one―not even Chester himself―realizes that the little country cricket may just be able to teach even the toughest New Yorkers a thing or two. This has been a delightful book that we are enjoying immensely. But I feel like a good part of the reason we’ve enjoyed it so much is because we are listening to it on audio. We listen to a lot of audio books – when we’re traveling or to give mom’s voice a break or just because a certain book was available on audio. But this is one book I would specifically recommend listening to on audio. The different character voices, background sound effects and most importantly, the cricket chirping, really enhance the story. I mean, after all, Chester Cricket is no ordinary cricket – if you don’t have the book on audio, you miss out on hearing Chester chirp The Blue Danube or Onward Christian Soldiers. 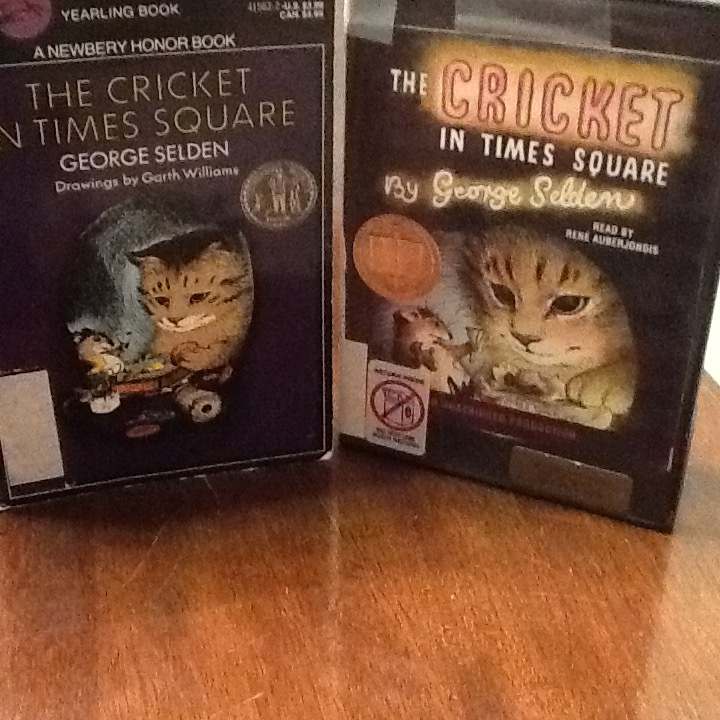 The Cricket in Times Square is a 1961 Newbery Honor Book. Great book, great story, but listen to it on audio for a real treat! 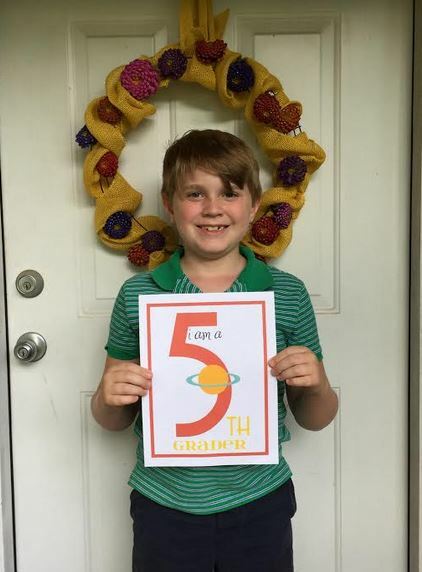 What do you use for Homeschool Science? There are endless options out there. 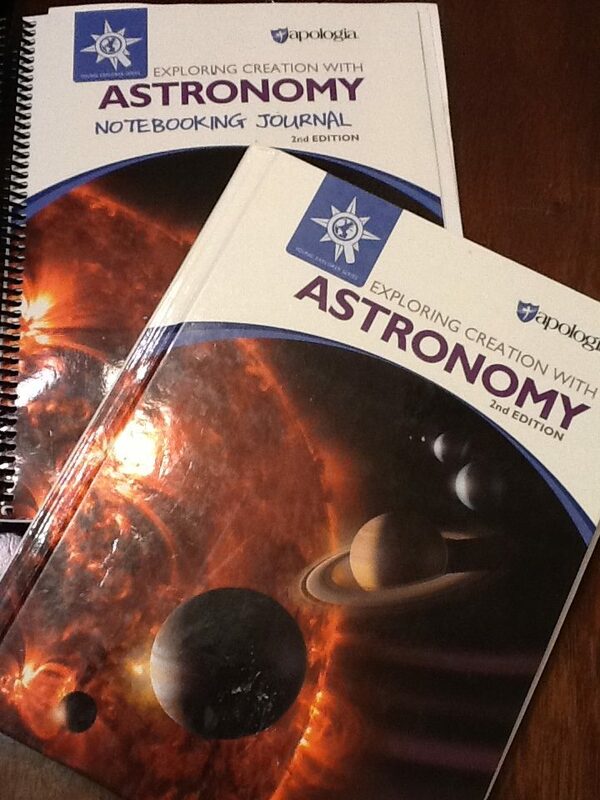 Here’s what we’re using for 4th Grade Homeschool Science. We are on our third year of using Apologia Science. We did an abbreviated run through of Zoology 1: Flying Creatures of the Fifth Day – we started before G was finished with 1st grade. We had zipped through BJU Science 1 because he loved science so much (and it was really easy) so I had Flying Creatures on standby for 2nd grade so we pulled it out and started. I say “abbreviated run through” because Flying Creatures is WAY in depth (and frankly a little boring at times) and his attention span wasn’t there for it. Learning Animal Classification was good because that helps in the future Zoology books, learning about birds was great – especially since we were doing it in the spring and we put up bird feeders in the backyard and got to observe lots of birds. The flying reptiles section (pterosaurs) was great for a dino-loving boy. Bats were interesting. But the final chapters on all the flying bugs were what we just hit the highlights of. We started it in spring of 1st grade and finished shortly before Christmas of 2nd grade. My plan was to do Zoology 3: Land Creatures of the Sixth Day for 4th grade but G wanted a break in animal sciences. He really wanted to do Astronomy. So I said everything above to say, this year, we are using Apologia Astronomy. I ordered the newest edition because there has been so much new information since the previous edition was printed. So far, I, personally, have been enjoying astronomy more than zoology – just as a topic, not because one course is better than the other. We love the format of Apologia. We love the way the textbooks are written – easy to read and understand. We love the notebooks that go with them. And we love the in-depth study of one topic at a time. (Except flying bugs, ha!) Elementary science when I was in school was like a mad dash to throw a bunch of things at you in a year. Parts of a plant, photosynthesis, magnetism, weather, basic chemistry, identify types of trees, birds and bugs, the end – and then start over the next year with basically the same topics without ever going very deep. G is a deep child. He doesn’t care for basic surface information. That’s why Apologia works for us. I did make one mistake when ordering our Astronomy. I did not get the Junior Notebooking Journal. Oops. We are making it work, but make sure you know the difference and know which one you need. 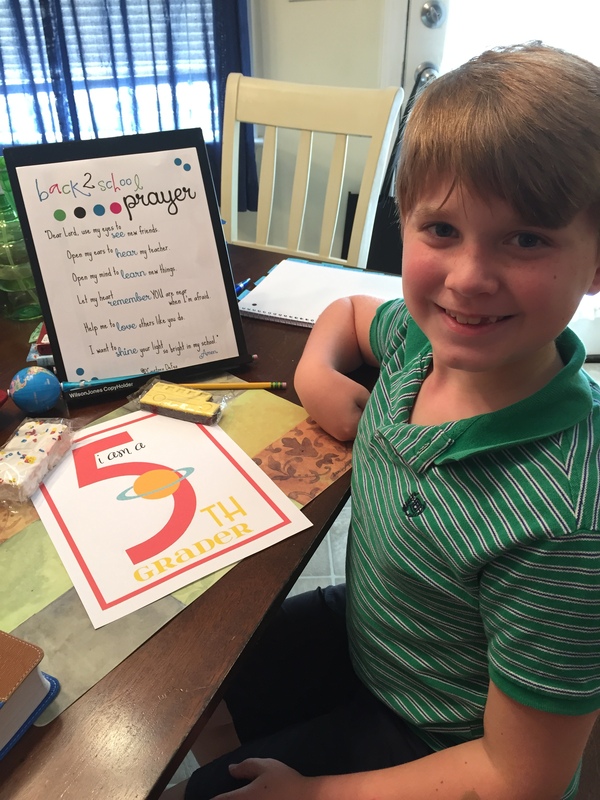 4th Grade is halfway over (like literally, January 8th was our 90 day mark – woohoo!) and while we’re making good progress with our school work, I’ve done a terrible job with the blog this year! I’m hoping to change that. I don’t really make New Year’s Resolutions, but I want to blog more about homeschooling in 2018. Stay tuned for regular features like “Book of the Week” and “Subject Spotlight”!